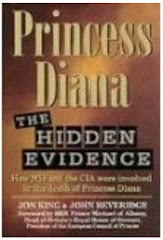 During my research concerning the crash that killed Princess Diana I have come across several sites and books mentioning satanic ritual activity and the Royal House of Windsor in the same breath! One thing did strike me as odd though...the fact that the Mercedes in which Princess Diana was killed slammed into the 13th pillar! Sure this is the 21st century not the 18th century where witchcraft, superstition and the unexplained reigned supreme, but just because society has modernized considerably that doesn't rule out the fact that plenty of folks in this day and age still believe and indeed practice pagan rituals that were popular not so long ago. The English Monarchy is apparently steeped in secret societies such as the Freemasons and the rather more sinister and less well known Illuminati! Anyway far fetched as some of these satanic ritual allegations may be, I am a student of the school of thought that states There Is No Smoke With Out Fire and for that reason I shall add my very own two cents and some on this issue of royalty, satanism and bloodlines! TO BE CONTINUED! First time here? Click the links to your right to read completed posts.